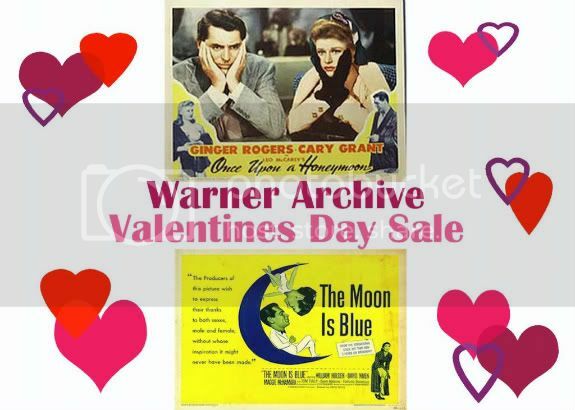 With Valentine's Day exactly one week from today, I felt it fitting to advertise the great sale that the WB Archive is having - $44.95 buys you four of their romantic classics. Click HERE to visit the page. My top two picks are The Moon is Blue (1953) and Once Upon a Honeymoon (1942). I've been wanting to blog about The Moon is Blue for quite some time now and haven't gotten around to it. I bought this film a while back on one of my WB archive spending sprees and am soooooo glad that I did. The Moon is Blue is about a girl who, by running into a man, has a crazy serious of events. Upon meeting Don, Patty agrees to go to Don's apartment to help him sew on a button on his jacket. Once up in the apartment, Patty ends up cooking dinner for Don and his ex-lover's father! What follows is a great love triangle between William Holden (Don), Maggie McNamara (Patty), and David (David Niven). This spectacular cast is directed by none other than Otto Preminger, who's ballsy gamble of releasing a picture not approved by the Production Code certainly paid off at the box office. While this film many not seem that edgy today, I can see how it was extremely scandalous at the time. With numerous references to Patty's virginity - Patty even comes right out and tells Don she is a virgin - and the film's use of the word pregnant made for an all out ban and several protests from many different groups. I think the film has some great dialog and Holden and Niven are wonderful. If you are planning on getting some Warner Archive films, now is a good time. At a little more than $11 a piece, this is the cheapest the dvds have been; plus there are some really great titles to choose from. If you are a classicfilx member and don't want to splurge for dvds, this is a definite rent!! I like Ginger....love this post.